This article is adapted from Charles Morris’ weekly audio commentary. Click here to hear the full segment. “The great thing about getting older is that you don’t lose all the other ages you’ve been.” A quote from Madeleine L’Engle, the author of the bestselling book A Wrinkle in Time. She also happens to be a Christian. It’s been said that with age comes wisdom, kindness, confidence and ease. 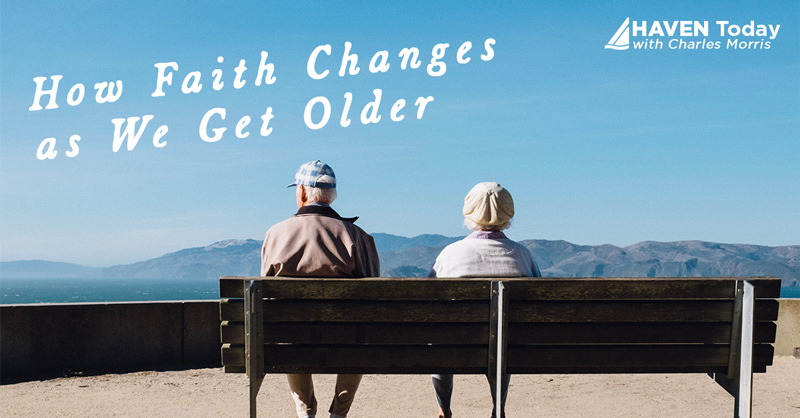 Each morning when we are together, my wife and I—both now in our sixties—find that our prayers are spent more on those who are older than us, as well as some who are younger. Both of us still have moms who are living and require increasingly more attention. For my wife, it’s getting ready next month for what will probably be the final move for her mother into one of those assisted care facilities. For my mom, we all thought last year would be her final year on earth, but it wasn’t … she made it to 100. Now with dementia setting in more, her pastor, her doctor and others are saying this will be the year she heads home to heaven. Getting older finds us with responsibilities in both age directions. This week, our daughter has surgery that will be followed by a completely different surgery a few weeks later. Guess who’s expected to be close by? Her mother. But aging also means that you begin praying more for your own physical needs. Last week, I was praying for my first surgery to remove my first cataract. Everyone in the family was praying and standing by for news from the three-minute laser procedure. Thankfully, my anxiety was put to rest when I found out they would NOT be inserting a deadening needle into my eye. Turns out the shot went just below my eye, but it still hurt. I’m not looking forward to needle #2 for the other eye. I received even more comfort when I found out my surgeon was a Christian who listened to HAVEN Today while in medical school. And still more comfort when he asked to pray for me and his part in the name of Jesus. It was a great time to share my faith with others in the surgical suite. Mike Love, an American singer, had it right when he said this about getting older, “… you get a chance to tell people in your life how much they mean to you.” As I get older and face new challenges, I know Jesus is on my side. I’m in his hands. And that’s a great comfort to me as I share with others my own thoughts on getting older. I listen to Haven Today. Good program. Gets to the heart of what matters..